Okay, okay, okay…..I’ve accepted it’s fall now, and I’ve decided the only way to enjoy this, is to put on some fabulous clothes and a pair of fall boots, and actually embrace the beauty that fall is. Because, I mean, it is quite gorgeous! I’m lucky enough to live in a country with four beautiful seasons, (although I’d trade winter in for more summer, FOR SURE!) and instead of complaining about it, I should just enjoy it. I’d also like to announce my collaboration with Clarks Canada! Take note of the amazzzzing fall boots. I know you guys already noticed how fabulous they are! I could definitely enjoy fall a lot more wearing these babies! The entire outfit just made me like fall a bit more, actually. Clarks has just launched a pop up shop in Downtown, Toronto (77 Bloor St. West) this fall, for a limited time only! The pop up shop will be open until January 31, 2016. K, let’s talk about these gorg boots though. Snakeskin, leather knee highs. They come in black and dark brown for those of you who prefer brown. I kinda wanted BOTH! Cause, who wouldn’t? I’m obviously obsessssed with the snakeskin print, because hello, have you seen The Chic Confidential’s logo?! Clearly need these boots in my life! 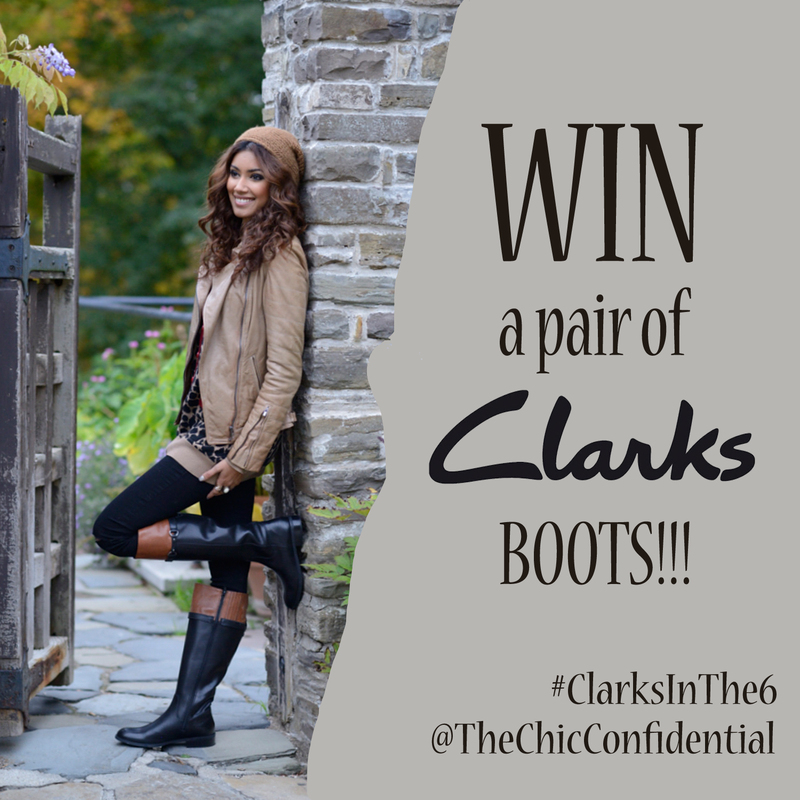 Want to also own a pair of amazing Clarks?! I mean, that’s a no brainer….OF COURSE YOU DO! One of my lucky readers will get the chance to win a free pair of boots of their choice! All you have to do is go into the Clarks pop up shop at 77 Bloor St. West, take a photo with your favourite pair of Clarks shoes, put that on Instagram and tag @thechicconfidential with the hashtag #ClarksInThe6 and you’ll be entered immediately! PS. I’ll be heading to Clarks media event tomorrow evening at their pop up shop on Bloor St. Be sure to follow me on Snapchat for all the fun, at kim-marquis. This post was sponsored by Clarks Canada. All opinions are my own. Previous Post The Fall Trench.